A single bat can eat up to 600 mosquitoes in one hour, 3000 insects in one night, yet due to unwarranted human fear and persecution, bats are in alarming decline. Because of the tragic loss of bat populations, farmers and homeowners now use more toxic pesticides. You can help restore nature’s balance by building a bat house. 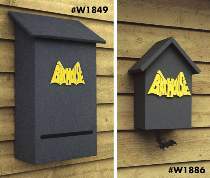 We offer plans for both a small and large bat house. Building bat houses and placing them at different heights greatly increases your chance of habitation. Large bat house measures 29"H x 18"W x 9"D. Small bat house measures 16"H x 11-1/2"W x 7"D. Plans drawn FULL SIZE. Special includes both plans and #1297 The Bat House Builder's Handbook by Tuttle and Hensley (36 pages, 8" x 10", paperback).